AFSTEREO, for today's accurate spots and songs. Aircheck™ is a US-patented radio and television monitoring technology, engineered by Media Monitors® USA, to listen to top-rated radio and television stations in major markets. 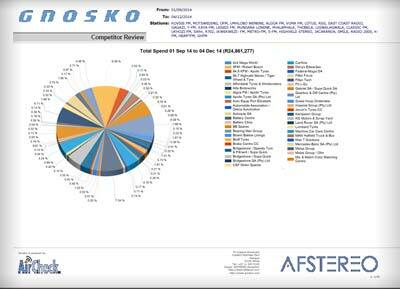 Gnosko is AFSTEREO's exclusive real-time radio and TV monitoring data portal. Get your reports for today's advertising and music here. This world first invention of ours gives radio stations, agencies and/or advertisers irrefutable proof of delivery backed by in-context of broadcast audio and visuals. A generic middleware integration tool developed by us to ease integration with media agencies' campaign management systems, radio stations' or TV-channels' trafficking systems. Proven, unique and affordable radio and TV monitoring products and services. The Best Radio and TV Monitoring software in the world. Near real-time Client Data Portal. Customised Media Analysis based and reporting. Standard and customized airplay charts. A Service for Record Labels and/or Artists. AFSTEREO was established in 2004 and is the leading South African supplier of real-time radio and television advertising and music data to the media, marketing, research, auditing, regulatory and music industries. Utilising USA-patented Aircheck™ technology, for which it holds the exclusive South African rights to, the company tracks all commercial and music airplays 24 hours a day on 33 radio and television stations across South Africa. Compliance Certification reconciliations of media campaigns. This means we're checking whether your adverts have aired according to your order confirmation, sent by the media owner. This includes generic spots, preference spots, opening and closing billboards as well as features and/or sponsorships. We are the ONLY media monitoring company in South Africa that's able to audit your Live Reads as well. Market Intelligence Data. Industry-wide analysis of radio and television commercial plays with spend and audience insights. Competitive Data. Specific competitor analysis of radio and television commercial plays with spend and audience insights. Copy of creatives included with reports. Customised Reports. Bespoke intelligence as specified by the client's requirements. 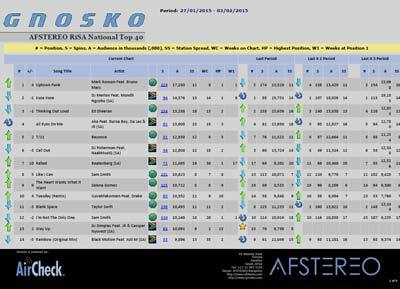 Music Airplay Charts. Rated on either spins, audience, spend or a combination thereof. Needle-time Reports. Certified reports on music airplay, underwritten by the in context of broadcast audio for verification in case of a dispute. AirCheck™ is the leader in broadcast monitoring of songs and commercials providing almost real time reporting tools for radio and television broadcasters, music media, record companies, advertising agencies and industry analysts. Media Monitors® is the leader in the United States for radio spot monitoring (MRC accredited), Newspaper Ad TrackingSM, Broadcast TV and Local Cable TV and provides sales and marketing tools for media research firms and advertising agencies. Their technology is called Aircheck™ and AFSTEREO holds the exclusive African-wide license to run and distribute Aircheck™ throughout Africa. 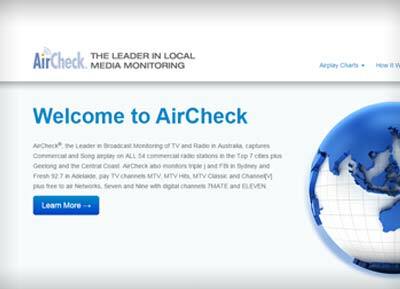 Aircheck™ patented broadcast monitoring technology reviews top-rated advertising media in major markets. It's our combination of expert human attention coupled with highly-sophisticated computer software that allows you to create same-day online reports anytime you want them, 24 hours a day. Aircheck™ provides competitive intelligence information for markets in the United States, Canada, United Kingdom, Australia, India and South Africa. Using the patented technology of Media Monitors®, Sales Executives can have details on a particular advertisement or an entire campaign at their fingertips in seconds. Every day, Aircheck™ matches audio to fingerprints of millions of radio, TV and cable commercials and scans hundreds of newspapers for ad data. All this information is available on the easy-to-use web site of AFSTEREO, called Gnosko. Media Monitors® is a subsidiary of RCS®. RCS® is the world's leading provider of broadcast and Webcast software, serving over 9,000 radio stations, TV music channels, cable companies, satellite music networks and Internet stations worldwide. The Media Monitors® broadcast content recognition process is protected by U.S. Patents 5,437,050 and 7,386,047 and additional patents pending. Want to see as demo of Aircheck™? Browse to our contact page and send us an email or give us a call and our friendly staff will take care of the rest. Gnosko is AFSTEREO's exclusive real-time radio and TV monitoring data portal. Gnosko uses US-patented radio and television monitoring technology, called AirCheck™, engineered by Media Monitors® USA, to listen to top-rated radio and television stations in major markets. Near Real-Time reports. Data is being processed every hour and posted to our database. Report formats: HTML, MS Excel, PDF, MS Word and XML. Report scheduler. Standard reports can be scheduled to be send at preferred dates and times in a choice of the above formats. Raw data is also available on request. Responsive design. Gnosko was designed to be usable on any device, platform and browser, including mobile devices and tablets. Want to see as demo of Gnosko? Browse to our contact page and send us an email or give us a call and our friendly staff will take care of the rest. A service exclusively designed and built for media owners. Our Error reporting service enables a radio stations and TV-channel to put missed ads back on air within the same campaign. AFSTEREO is now integrated with the top mainstream back-end trafficking systems. Want to see as demo of our Error reporting service? Browse to our contact page and send us an email or give us a call and our friendly staff will take care of the rest. A service exclusively designed and built for agencies and/or advertising clients. AFSTEREO provides Media Agencies and Marketing Clients with independent and accurate audit reports detailing compliance / non compliance to latest iteration media bookings. Good corporate governance, backed with independant audit reports. Peace of mind regarding media strategies. 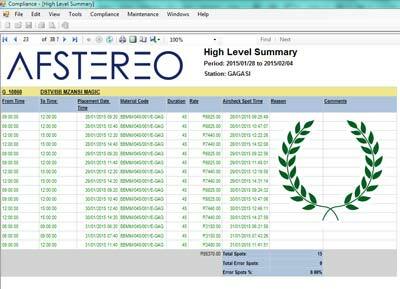 AFSTEREO is now integrated with some of Media Agency media management systems, significantly improving the turn-around time on compliance reports. 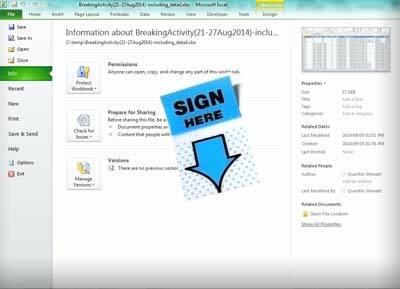 Want to see as demo of our Compliance Certification service? Browse to our contact page and send us an email or give us a call and our friendly staff will take care of the rest. 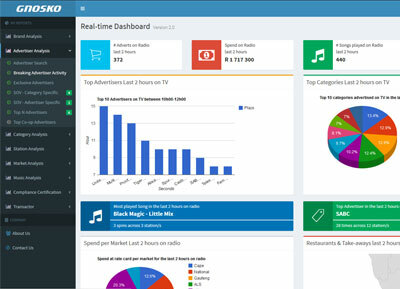 Near Real-Time analysis and insights of advertising and music via Gnosko. Breaking advertising campaign alerts and/or new song alert. Exclusive Advertising of selected radio stations and/or TV channels. Instant sales lead generation. Extensive Competitor review, including spend, audience and strategy. Top Advertisers and/or Campaigns rated either on airplay, audience or spend. Music playlist reports, comparing track sharing on stations. Radio station and/or TV channel sold-out percentage. Want to see as demo of our Market Intelligence reports? Browse to our contact page and send us an email or give us a call and our friendly staff will take care of the rest. Bespoke reports to cater for your client's custom requirements. 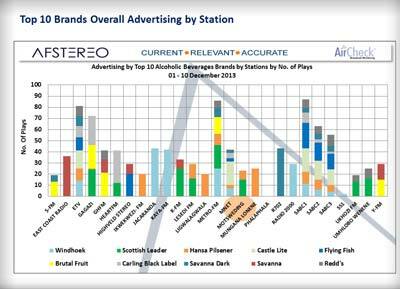 AFSTEREO provides detailed analyses of broadcast radio and television advertising and music content trends. In context of broadcast audio and/or visuals. Want to see a sample of our Customized Reports? Browse to our contact page and send us an email or give us a call and our friendly staff will take care of the rest. Unrivalled analysis of music airplay data which, undisputedly, is the most comprehensive and accurate database currently available in South Africa. Playlist reports. Analysing the playlists of selected radio stations, comparing shared music and playlist sizes. International vs Local music ratio of airplay on radio stations. Want to see a sample of our Music Reports? Browse to our contact page and send us an email or give us a call and our friendly staff will take care of the rest. Because of our most comprehensive and accurate database currently available in South Africa, our music charts are the best money can buy. Local or international only music charts. Music charts rated on airplays, audience or media spend. Song movement, new entries and drop-off tracks. Want to see a sample of our Music Charts? Browse to our contact page and send us an email or give us a call and our friendly staff will take care of the rest. A speciality product developed for record labels and artists. 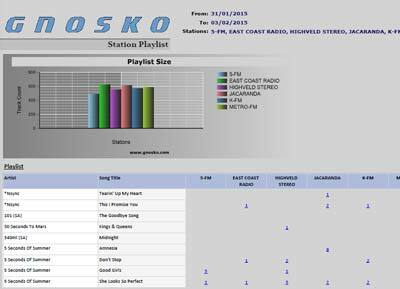 If used correctly, record labels and artists can monitor featured singles being played on radio stations. 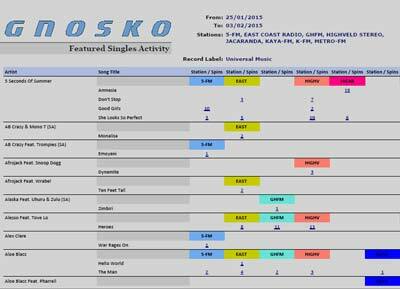 Want to see a sample of our Featured Singles tracking service? Browse to our contact page and send us an email or give us a call and our friendly staff will take care of the rest. Comprehensive, detailed and extremely accurate reports on music needle-time. Certified reports on music airplay, underwritten by the in context of broadcast audio for verification in case of a dispute. These reports were specifically designed for reporting on performing rights royalties. So whether you're a royalty management organisation, a radio station, a record label or an artist, this report is for you. Want to see a sample of our Needle-time reports? 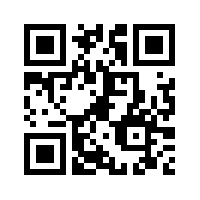 Browse to our contact page and send us an email or give us a call and our friendly staff will take care of the rest.